Today we celebrated my son’s 1st Birthday at our home with 30 guests. It was a fun birthday party and the food was wonderful. Koreans call the first birthday “Tol” and often times there is a “Toljabee” event. 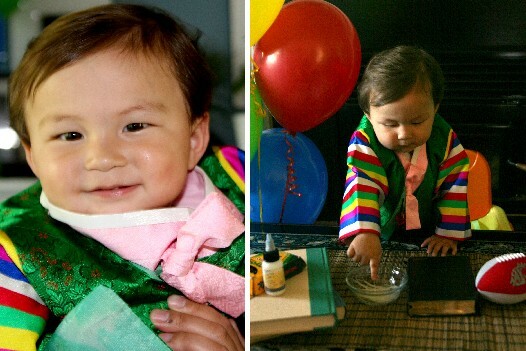 This event is considered the highlight of the party because the birthday boy/girl is dressed in traditional Korean garments called “Tok-Bok” or “Ham-Bok”. The child sits in front of a table full of festive fruit, rice cakes, and other food along with the Toljabee items. During the Toljabee event, several items are placed on a table. The child is then placed in front of the table and chooses an item. This is where the fun part comes in. Supposedly the first item he/she chooses will predict his/her future. Most Koreans I know set out items they hope for. For our Toljabee we put a football (my husband would love it if our son played college football), cash (for prosperity), noodles (for a long life), books (scholarly), and a bible (ministry). I was convinced our son would pick the football. I was so surprised when he picked noodles! Then one of his cousins shouted, “He’s gonna be a chef!” I hadn’t thought about that.. but looks like my son is taking after his mama! So now you know a little but about Korean culture. But I’m sure you’re eager to make your own Kalbi at home. So I have some good news and bad news for you. Yesterday I posted part 1 of some tips on preparing short ribs for Kalbi marinade. However because I wanted to make sure everything I prepared was perfect for today I had to redo the Kalbi marinade. <- Thats the bad news. The good news is that the recipe modifications I made last night was well worth it! As I posted yesterday, the owner of the little Korean grocery store highly encouraged me to wash the meat and soak it in water for 2 hours 2 times. Then my mom told me to add coke or 7 up to the mixture and a kiwi. I ate Kalbi twice yesterday. When I ate a sample at breakfast the meat tasted good. Not as good as I’m use to, but I attributed it to not marinading for 2 full days. When I ate it for dinner I was completely unhappy with the results. The ribs tasted completely greasy and it was hard to enjoy the Kalbi. In all my Kalbi eating life I have never had greasy ribs. Something was terribly wrong. As my husband and I talked about it, we agreed it had to do with the ribs. In other words, not all Korean short ribs are created equal. The ribs I initially bought had a lot of fat on them. I did notice this at the store but didn’t think it would make a difference. Boy was I wrong. 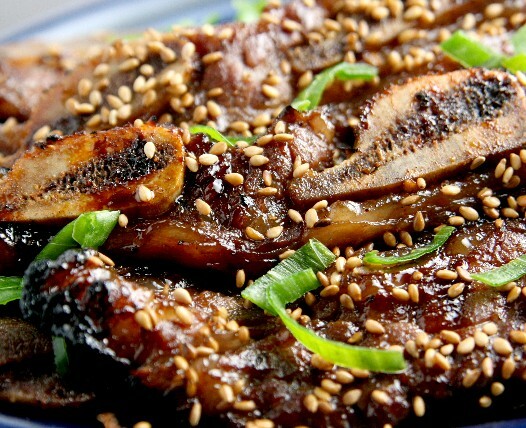 If you are planning to make Kalbi make sure your short ribs do not have lots of fat of them. The excessive fat completely ruins this wonderful dish. But don’t feel bad for me. After dinner I drove to another Korean Grocery store. I am so glad because I bought 3 packages of beef and just looking at them in the package I knew I did the right thing. The beef had normal marbling but no excessive fat. They looked way leaner than the first ones I bought. I wish I had a photo but I had to kick it into high gear last night to prepare today’s meal. Also looking at the package I did not see the same bone dust I saw with the first batch. Because it was so late in the evening last night I decided to just put them straight in the marinade and say a prayer. This morning when I woke up, I put the ribs that were on top on the bottom and vice versa. When it was time to grill, the smell drifting into the house said it all. Everyone loved the ribs including me. In conclusion by not soaking the ribs, I found that there was no difference in taste. By not using a Kiwi, I did not find the ribs were less tender. Marinading for 1 night was plenty enough time for the ribs to soak it up. I also did not use a can of soda because I didn’t have any left and the ribs were still AMAZING and AWESOME – Operation Kalbi Successful! So here’s the recipe below. Enjoy! Place ribs in a large ziplock bag or a dish that can hold them all (I used a large pot with lid). Combine all the ingredients together and stir for 1 minute. Pour the marinade into the pot, dish, or ziplock over the meat making sure ll the ribs have been coated. Cover and refrigerate over night. The next morning make sure to place the ribs that were on the bottom on top, and vice versa. Continue to refrigerate until its time to grill. Heat grill to medium-high heat and when the grill is nice and hot add meat. Grill each side for 3-4 minutes. Garnish with addional slices of green onion and toasted sesame seeds. *Looking for the other type of Korean Barbequed beef recipe called bulgogi? It’s right here. 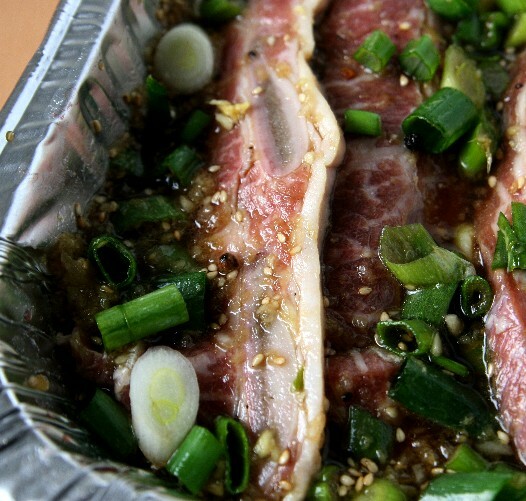 « Kalbi : Korean BBQ Shortribs Marinade Part 1. Use Korean red hot pepper paste instead or in addition to the red pepper flakes. Much richer flavor. Will these work just as well in the oven? I also prefer less salty tasting food and use “tau vi yeu chay” vegetarian soy sauce from my local asian market as it has the lowest sodium amounts out of all the brands they carry. Additionally, i substitute honey for the sugar. 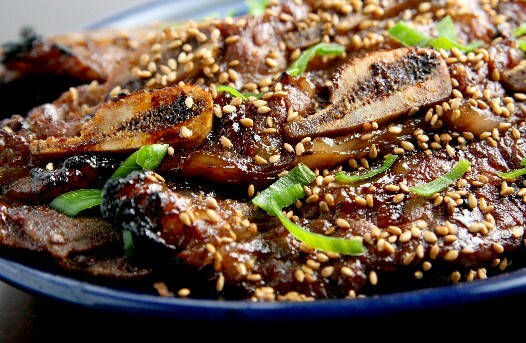 My husband never orders kalbi at the restaurants any more because he likes this recipe more! Thanks for such a great recipe! I recommend using the Tamari soy sauce by San-J. It’s got way better flavor and nowhere near as salty. I use Kikkoman because that is what I usually buy from Costco. I have just discovered your site. wonderful. Made Kalbi a couple times but this is my favorite recipe. There are many more recipes I will be making! I was just wondering what brand of soy sauce do you recommend? I usually use Kikkoman soy sauce when I cook. A colleague recommended me to your resource. Thanks for the details. I read in your marinade part 1 about adding 7up or kiwi to tenderize it (my mom uses Korean Pears)…im assuming you didnt do this in this recipe, was the Kalbi still tender? We make kal-bi quite often for dinner & potlucks since it’s a popular dish in Hawaii and thought your recipe was really delicious. My Korean hubby loved it! This will be my new go-to recipe. I made this on 9/30/12 for my boyfriend and I and we both LOVED it!! Soo simple and sooo delicious.. So I made these.. They were absolutely good when I marinated them for no more then one hour! How are you able to marinate over night or even two nights? Am I missing something? Am I suppose to dilute this with 7 up? Or is if my soy sauce brand? Loved these ribs! Entering them in a rib cook-off on 4th of July! Made this tonight- started with the bulgogi recipe but realized I had the Kali short rib cut- marinated for the hour stated in bulgogi recipe and grilled- all was good! I made a bit extra marinade and sautéed kale in that to serve along side with rice. Dinner was delish. Thanks! !